The new year is a clean slate and a great time to make changes to your health care, and your oral health is no exception. Because of the significant link between your oral health and your overall health, there has never been a better time to make your dental care a priority, and your dentist in Brampton has some tips on how you can easily create some changes for 2019. While it may be simple to remember to brush your teeth when you wake up in the morning, brushing before bed is easier to overlook when you’re busy or tired after a long day. Brushing eliminates all the bacteria in your mouth from the food you’ve eaten throughout the day, which is essential because it will turn into plaque that sits on your teeth and breaks down your enamel if it’s not removed. Many people reevaluate their food choices in their resolutions because the new year is a great time to make some healthy improvements to your diet. If you find yourself snacking in the afternoon, consider choosing fruits and veggies over chips, crackers, or bagels. Fruits and vegetables such as apples, pears, and carrots neutralize the acids in your mouth that cause tooth decay and cavities, and they wash away the excess debris in your mouth left over after meals by increasing saliva flow. Flossing is a simple habit that many people skip because they are tired or feel it’s time consuming. However, flossing is important because it removes the plaque and bacteria buildup in between your teeth, which is essential because you can actually get cavities there. If flossing is not part of your daily routine, commit to at least one day a week to start with and then slowly add days as it becomes a habit. 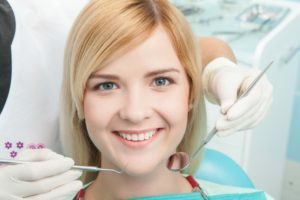 Because we know there’s a correlation between your dental health and other concerns in the body such as heart disease, high blood pressure, and diabetes, visiting your family dentist in Brampton consistently for a six-month cleaning and checkup is critical not only for your oral health, but also your overall health and well-being. During every routine examination, your dentist screens for issues such as gum disease, tooth decay, and cavities. Detecting these concerns early gives you the best chance of successfully treating them. The good news for patients with dental insurance is that six month cleaning and checkups are typically covered, which means that there is very little or even no out-of-pocket cost for your preventive appointments. If you don’t have dental insurance, your dentist’s treatment coordinator can offer some helpful tips on fitting dentistry into your budget. Are you ready to take charge of your oral health in 2019? Contact your dentist today to schedule your next visit. At Torbram Dental, our team of dentists provide compassionate and comprehensive dental care in a warm and friendly environment. We focus on giving each patient personalized attention. and we invest in the latest technology to ensure your comfort. If you would like to reach Torbram Dental, you can call us at 905-792-7163 or contact us through our website.